Spirit Parade is a commercial otome game with Asian mythological themes currently in development by Lettuce Waltz, aka artists Rins and Akane, and writer/programmer Lore. Please follow our production diary or devlog here on itch.io for the latest updates! If you purchase the full game ($20 full-price), you will be able to download patches that add content to the base game as it is released. You can also purchase and play each route separately ($5 each) as a standalone game. Currently, Hayato's route and Mikio's route are available for purchase. If you pre-ordered the game prior to October 5, 2017, you have the full version and will automatically receive all the future routes and updates. Upon completion, the full version of the game will have 5 routes/capturable characters and more than 30 different endings. Unfortunately, voice acting for the game will be suspended for the time being. There have been some complications with scheduling and implementation and until those are worked out, none of the released routes will have voice acting. We hope to be able to patch the voicing into the game at a later date! The demo covers the entirety of the common route and should take about an hour to play, depending on your reading speed and choices. Please note that Mikio and Diaochan do not appear in the demo. The demo is fully voiced. Spirit Parade has been greenlit and so everyone who pre-orders the game will also be receiving a Steam key once the game is released there. Thank you so much for your support!! The story centers on Nara (her name can be set by the player), a cynical 17-year-old girl who mostly shut herself off from the world after contracting spinal polio at a young age and becoming unable to walk. One night, a festival is going on in town. Instead of going with her family, Nara wanders off alone, not wanting to slow them down. As she goes through the various stalls, things become hazier and gradually Nara finds herself surrounded by people with ears, tails, and horns…then suddenly her clothes and wheelchair disappear! After a run-in with a rambunctious kitsune named Hayato and a scary-looking dragon officer of death named Shuye, Nara finds out that her soul has left her body and has been transported to the Spirit World, where all the demons and spirits are celebrating a month-long festival. Until the end of this festival, she won't be able to return home… Will Nara survive long enough in the Spirit World to go back in one piece? Will she be able to get over her bitterness borne from the past, or will she be engulfed in hatred and lose sight of what's truly important? You can see a labelled character line-up here, showing all of the main cast of the game. NARA. (voiced by Jill Harris) A resourceful, bright girl who unfortunately has suffered from spinal polio from a young age. As a child, Nara was positive and amiable, so she made friends easily and had few problems. As her spinal polio developed, however, she became overly self-conscious and paranoid. She especially hates to be pitied. While she's still kind at heart and wants to help and be useful to others, she does not expect the same in return from the world at large. Nara greatly distrusts other people and is suspicious of those who are kind to her. She operates on a one-strike policy, so once someone has wronged her she will antagonize them pretty much forever. HAYATO. (voiced by Mark Allen Jr.) He knew the heroine when they were kids, before her polio symptoms showed. 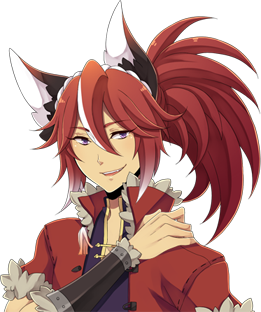 Despite being a fox demon, Hayato frequently came to the human world out of curiosity. Being young by demon standards, Hayato is rather immature. He's also used to fighting for attention from his large family. Hayato has trouble understanding that other people are different from him and is confused whenever others don't want to do things his way. In this regard, he comes off as being very self-absorbed. It's not that Hayato only cares about himself. He does want others to enjoy themselves and be comfortable in his presence, it's just that he has trouble considering things from a different point of view. Hayato prefers spending time outdoors. SHUYE. (voiced by SungWon Cho) One of the Heibai Wuchang, Shuye assists the king of the underworld with spirits, making sure everyone is in their right place. In particular, he deals with reaping good souls. Being used to dealing with the dead—who are often unhappy with their current state—he has become very patient and stone-faced no matter what the circumstances. He is a man of routine and prefers to operate in a stable, ordered environment. As a result, he is not very good at dealing with changes or at improvising. He shies away from conflict and is often called gullible or too trusting. 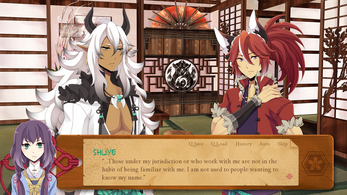 After living and working in the court of the dead for so long, Shuye is very knowledgeable about the court, but not very much about what lies outside it. HAIYUE. 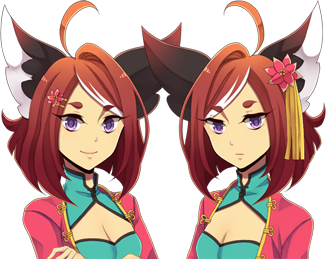 (voiced by Howard Wang) One of the Heibai Wuchang, Haiyue is Shuye's partner and childhood friend. He is the one tasked with reaping evil souls. Unlike Shuye, Haiyue is flighty and hedonistic. He takes every excuse to skip out on work and spend time in the tea houses above ground, leaving Shuye to deal with the pile-up of work. Despite his sweet, princely smile, Haiyue spouts insulting phrases and has no qualms about manipulating people to dance in the palm of his hand. Though he's constantly taking advantage of Shuye's gentle nature, Haiyue is protective and somewhat possessive of his friend. He views the world as black and white, but considers himself as someone who deserves to enjoy it and lord over others. He's particularly vain about his feathers. MIKIO. (voiced by River Kanoff) The older brother of Hayato, Asuka, and Sakuya. He was born from an earlier litter, so they should be showing him deference as the eldest still in the household… However, rather than being a dependable older brother, Mikio is a NEET and a drunkard, always loafing around the house and relying on Asuka and Sakuya to take care of him since he refuses to get a job. He says wise things from time to time, but spoils them by following up with a plea for money or more wine. It seems that he was not always like this, but his siblings can hardly remember a time when he was not a drain on resources. 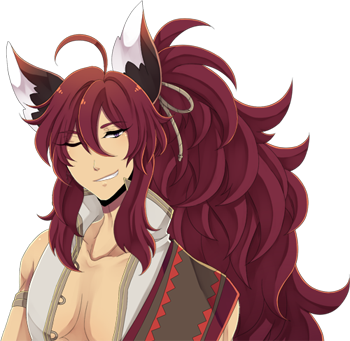 Mikio is good-humored and intelligent, but only when sober (which is hardly ever). DIAOCHAN. 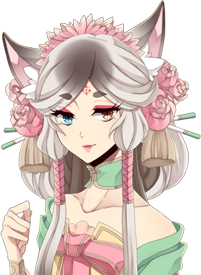 (voiced by Natalie Van Sistine) Renowned as a great beauty in the Spirit World, Diaochan is one of the magistrates in the underworld. However, she has seniority over the other magistrates because of her vast information network and smooth social skills. It is nearly impossible to go against Diaochan personally or politically because of the amount of blackmail material he has accrued over the years. He is a childhood friend of Shuye and Haiyue's and they all still get along, but the other two are careful never to get on his bad side. To Diaochan, beauty is very important. She can often be found fawning over female workers of the underworld and tends to spoil them while acting harshly towards men. SAKUYA (left, voiced by Amanda Gonzalez) and ASUKA (right, voiced by Sarah Williams) are Hayato's twin sisters who were born from the same litter as him. Despite their child-like looks, they are much wiser and more mature than he is. They insist on Hayato showing them deference as his older (by a few seconds) sisters and he has no choice but to listen, given how scary they are. He refers to both of them as "aneki". Sakuya and Asuka are in charge of the family's finances. Their family being quite large, this is something of an organizational nightmare, so the two of them have developed into rather stingy people. It's often said that they resemble yakuza loan sharks more than delicate young ladies… Be prepared to pay a lot of interest if you dare borrow from them! While they both have similar tastes and sensibilities, Sakuya is more outgoing while Asuka is more reserved. (Sakuya insists that her twin is not shy, only doesn't like talking to people whom she considers beneath her) Asuka usually whispers insults to Sakuya, who then transmits them to the intended recipient. 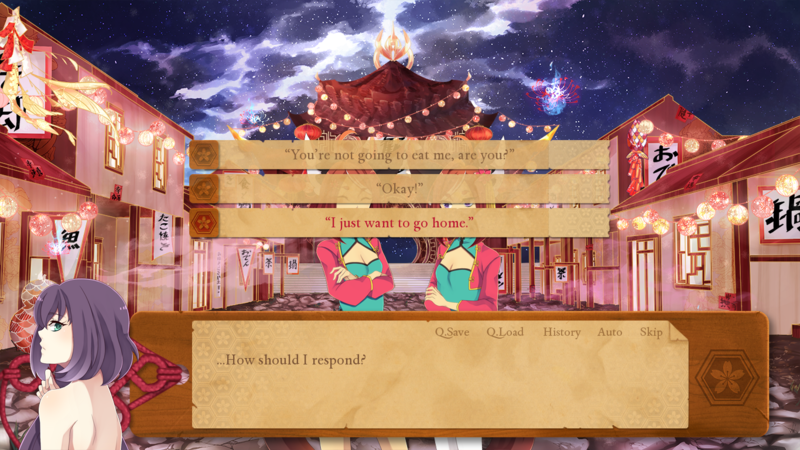 Spirit Parade is a Lettuce Waltz visual novel. It is being developed using Ren'Py and will be released for Windows, Mac, and Linux with mobile systems hopefully in the future. 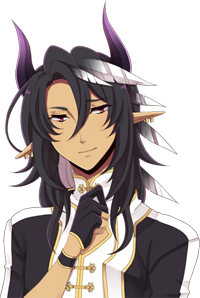 Mikio's route has been released! Hayato's route has been released! i purchased this game four years ago. the fact that it is still incomplete and the developers have seemingly abandoned ship is incredibly disappointing. if they are no longer working on this game, they should at least do the right thing and let us know. i deeply regret supporting these devs since it seems they cannot even be bothered to communicate with us about potential delays or other issues that come up and impact the release of the rest of the routes. under no circumstances do i recommend you purchase this game as is. it is likely not going to be finished any time soon (if at all) and your money is better spent elsewhere supporting other indie devs who actually take the time to interact with and keep their supporters/customers updated. Just messaged Lore on twitter to see if we can possibly get any answers. I tweeted her 84 days ago as of today. No respone. Will update if anything happens but I doubt anything will. Knew this game was sketchy the moment it became clear they had barely had made any progress on any routes during the long span of time people have been waiting. Do not get this game until all routes are released! It's just too fishy to buy otherwise. Just came back here to see if we had some news, and sadly nothing - I guess I'll keep waiting, I don't actually have issues with that nor will I be asking for a refund since I adored the two routes we got. But that leads me to my second point. I'm so surprised by the comments. Honestly, I didn't expect people to complain about the "lack of romance". I definitely don't agree with that. But the romance here is more subtle than in some other games, and leaves lots to the players' imagination - and I like that. Now, I totally understand some people may play otome games only for kisses and steamy scenes, but I'm not necessarily in for that. After playing litteraly dozens of otome and BL games, I know for sure a good romance game doesn't need to have any explicit kissing or sexual scenes to be perfectly fine and great. So yeah, it may not be your jam if you NEED kissing, but I think it's a very nice, sweet and touching game if you're fine without it. What it definitely IS, it's an otome game. It's just not your standard otome, that's it. After playing as many games as I did, you just start to see more and more atypical games that break the codes, and you also start to think of it as refreshing. If you want great but more conventional indie otome games, I suggest Nusantara: The Legend of the Winged Ones and Cinderella Phenomenon (both are free and a new Nusantara game is in the making too). Developers, at least give some tiny sign that you are well and alive. All three devs can be found on Twitter, and as of January 2019 they're all alive (no info about the artists' health given). Just skimming through their accounts I can't see any of the three mentioning Spirite Parade anywhere except in their bios. Akane (@akanekari) has been the least active, but her last activity was on January 21st where she replied to Rins. Rins (@lettucetown) has been more active than Akane on Twitter, but even then there was a gap between June 2018 and December 2018. Her last Twitter activity was on January 16th 2019. Lore (@yandere) has been most active on Twitter. A quick scrolling through her timeline shows that she's been frequently tweeting and retweeting about all kind of stuff, ranging from other people's projects to real life stuff. I can understand that real life can take someone's attention away from the internet and social media, but seeing how the writer has not only been online but also has the time to promote other projects and whatnot, I find it very disappointing and upsetting that she apparently can't be bothered to update people here who have spent real money on their game. They promised monthly updates, but even that promise only lasted three months aka three meager posts before they disappeared again. Thank you for your response. Huh. Okay It been 3 whole years since I pre-ordered and the full game still isn't released?? This was my first time ever paying for a game and I thought the point of paying for a game was to support the development move a bit faster and smoother? At this point I just want a refund does anyone know who do I contact? I read they can only do a refund if its been less then a year. But I'll try it anyway. I don't mind the slow update, as I have a life. The 'lack of romance' as some people point out, I don't see an issue. There is romance in certain area's, there are many different endings and outcomes which I appreciate. Also people having an issue with the character... Well I find it refreshing. I may not like the MC but it doesn't make it a bad story. It is a story. I will say to others, just because it doesn't have a kiss scene doesn't mean it is NOT an otome. There are plenty of relations where people will prefer emotional affection over physical. Just because it may not be something you favor does not mean it is abnormal. The slow update I may 'not' mind, I still don't like. I luckily pre-ordered it early so I only paid $10. But If I have to wait another year for it all I may have to ask for a refund. I understand things can come up in life, but the developers should be transparent, try to inform their fans/followers about what is happening and why things may be slow or even on hiatus. I will say it is not a great game, but it is not terrible either. If they do finish this and create another game perhaps they can take the criticism, and create a better game next. Ah sweet! Just sent them an email. Thank you for letting us know! So far, no. I just tweeted one of the developers. Let's hope I get an answer. Edit: I did not get an answer. Probably safe to say it's dead. Thanks for the info, at least. So nothing, no update on itch or their blog since September. Either call it quits or let us know if you're still working on it. This is ridiculous. This game does have romance elements. Otome is a girlxboy game, and not all otomes have kissing scenes. Now they did originally plan for a full game to be otome based, however, if you aren't careful you won't find yourself on any of their routes. Seriously, you have several endings per each character and you can easily miss the romance for these characters. There's a big difference between real otome and "game which does have romance elements". Many people wouldn't buy this game if the developers were honest from the beginning. It is a real otome, there is no real difference other then the fact others only want the kisses and good times, instead of wanting the good, the bad, and the ugly. I've played plenty of otomes to know, that you can have romance, and have romance that doesn't end in a kiss. "Romance that doesn't end in a kiss"
In all the routes and in all the endings? Well, I personally wouldn't call it otome. Otome game without even one kiss in all the routes is equivalent to a relationship where partners never kiss and never touch each other. Maybe this kind of relationship exist but it's abnormal. I think the description of the game should be corrected. Judging from the comments, it's not an otome game. Lettuce Walts shouldn't mislead people. I also would like a refund. I preordered this game 2 or 3 years ago and regret doing so. This game is advertised as an otome game and it's just not. There is a romance element but it's not about romance (which is what I bought it for). I really wanted this game to be great and support the developers but I feel cheated. Please give us those who preordered the option for a refund. This game has had a particularly rough day, so I wanted to throw some positivity at it. I understand the desire for more frequent updates, but I don't mind the super slow-burn romance. I think it's sweet, and I find our cranky MC adorable. I like this game. The art is beautiful, the story is compelling, the characters grow and change, and they end up as better, more fulfilled people. I can't speak for the entirety of the game, seeing as it's not finished yet, but it looks to be on track to be well worth the price to me. Keep it up! Patience is a virtue, but perseverance is an art! I bought this game two years ago and the development has been incredibly slow, I only bought this game for Shuye but later on I found out you could buy the parts separately -.- I have also read the comments and dislike the lack of romance, this is an otome game there needs to be romance and a kiss scene would be nice. I would like a refund as well. I might buy Shuye's route alone if I learn that Shuye has some actual romantic moments, but please give me a refund. Hi how do I get a refund? This game is not what I payed for and I have a feeling that this game will not be finished. Also this story is not worth $20 with no romance at all. I get that character development is important but with no romance I do not get the point of this story. Plus the mc is so self centered not nice at all. I don't get why making a character so unlikable is good for development. Honestly this is not worth $20! I'm pissed that I payed that for a terrible story and a unlikable mc! She learns nothing but to be selfish. In Hayato's story the ending left much to be desired I mean not even a kiss! What the heck I don't get how this is a story without a proper ending? I mean he comes all the way to her world and she's just so ungrateful! I'm sorry I tried to like this but I feel cheated! I get that their will be patches but for the $$ this is unacceptable! I feel that making a profit is important but 20$ for this I do not think is fair plus, I have no desire to read more. On top of that the only good character doesn't even has his route finished! Anyway I do not want to be mean. I'm just so disappointed in this because in the description it sounds like a really good story but not an Otome at all. Because their is no romance. So please refund me. I also think if I had known this game was like this I would not have purchased this either. It's seriously unfair. Thank you for listening to my opinion. This game does have romance, but it's difficult to get on either of their paths if you do not do the correct choices and actions. It's pretty easy to get on the romance path. The main problem of the game is different. If you mean by using a walkthrough then sure, It's pretty easy. I guess the difference between me and other otome players, is that I look for the story instead of the romance. It's pretty easy without using the walkthrough. I think the story is very important but if developers claim that it's an otome game then the romance is as important as the story. Unfortunately, it seems that developers didn't work enough on the romance in this game. That's why many people complain. I never expected that this game would have many steamy scenes but some kissing scenes wouldn't hurt. In the description it's written that Spirit Parade is an otome game. I personally think that an otome game without kissing scenes is weird. I don't mean that they should happen in all the routes but till now I haven't seen even one kiss. I like the story and the character development but I think romantic part of the game is very important as well. I've played Mikio's and Hayato's route but the romantic part and relationship development between them and MC were quite poor. 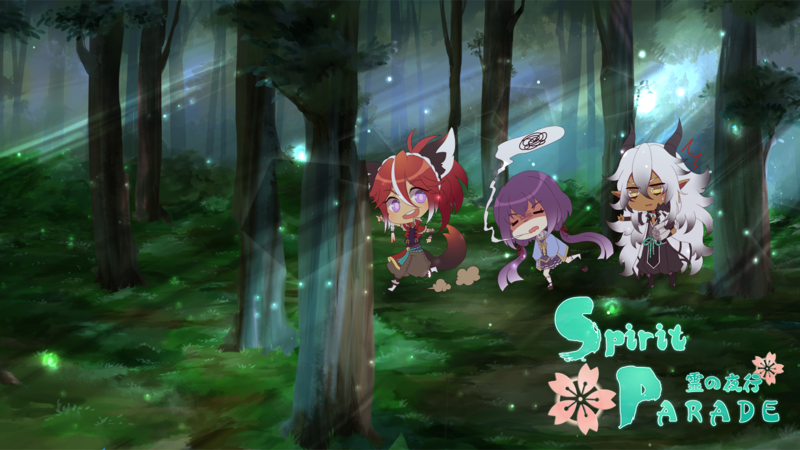 I'm sorry but if I knew that all the routes were going to be like this, I wouldn't buy Spirit Parade. This is a game where there is a bit of romance but I wouldn't call it an otome. I've just played Mikio's route and there wasn't even one kiss :( Will all the routes be like this - without kissing scenes? Largely, Spirit Parade is more about character development than explicit romance. There's not really going to be very steamy scenes in it. It has been almost 3 months since the production diary has been updated, 5 months for the itch.io development log, and a month since a dev has responded to a comment. I have commented this before, in my review in for Hayato's route, but an 'official' monthly update would be nice, even if it is just "still continuing this project!" The long stretches of silence, dropping a new route, and then more silence after maybe a month or two of release is incredible unnerving. I understand delays and having to focus on work and such, but I don't understand leaving everyone in the dark about what is happening. I enjoy this game and hope to see it finished one day, but until then, I would like to know the status of the game's progress. Thank you for your feedback. You're completely right of course, and we're sorry to have caused any worries or inconvenience. I'm usually the one who updates our social media and I've been stretched very thin recently due to a death in the family, among other things. I'll set a reminder for myself on my calendar and try my best to keep up monthly updates like before. I understand that it's important to keep everyone updated and I'll improve on that. Again, our apologies for not being more transparent. 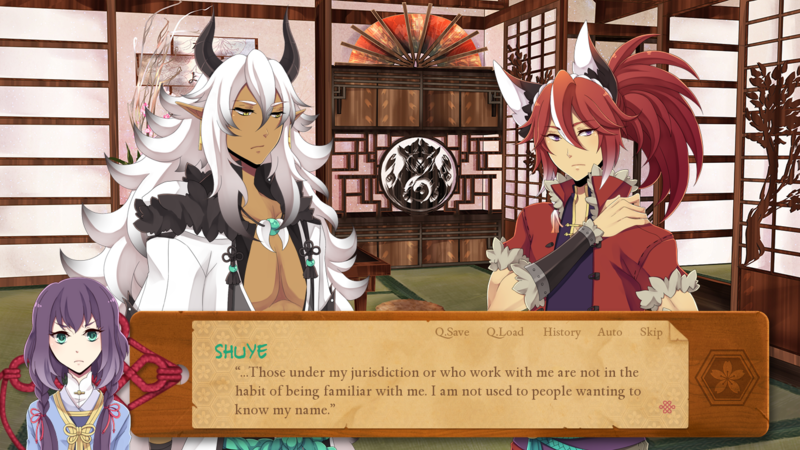 We're working on Shuye's route now and Haiyue will be released sometime after that. We will have release dates once a better estimate is available, but those should be some months down the pipeline still. I'm loving the demo so far! , it's a shame i have difficulty with using itch.io's payment system because in my country it only allows credit cards, will there be a release for steam? Yes, we will be releasing on Steam once the full game is complete. A lot is changing over there now, but as we have already passed through Greenlight, hopefully we have minimal problems getting the game up once it's done. I’m sorry to hear that! Does this help? 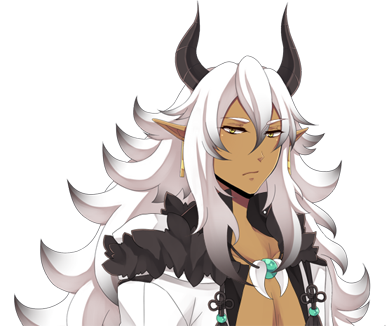 Purchased Mikio's route and no matter what options I select, he never shows up at all. I feel like I've tried everything but I just get premature endings :S Any help? Thanks! 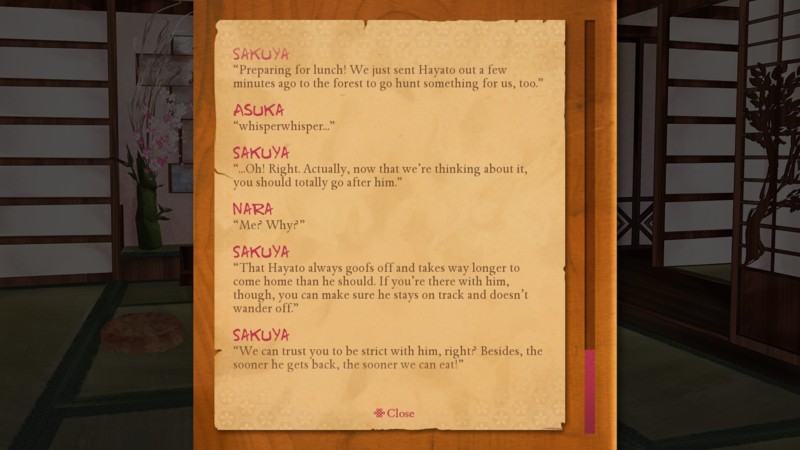 Mikio's route piggybacks off of Hayato's route, so you need to get onto Hayato's route before Mikio appears. After that, you'll be on a brief "kitsune common route" and your choices will affect whether you proceed to Hayato's route or Mikio's route. Probably silly question, but any ETA? We don't have an ETA for Shuye's route yet. We're all actively working on it and I think beta testing should start in another month or two, but there's still art assets that need to be completed for it after that. We'll be sure to update here and on our production diary once we have set a date. Omg, bought the game after playing the demo - its so great! Pity that the voices aren't present in the full game yet, the acting is wonderful. Also, is the 4-th CG (between Shuye and Mikio) in the game already and I missed it, or is it Daochan's intro CG and will be available later? Yes, that CG is from the demo content/common route and is the trio friendship ending CG. I wanted to ask if Mikio's memory section is working. I think I got all the endings, but I couldn't check. I'm using a mac (if there's any difference) so it just might be a problem for only macs i don't know. Hmm... It should be working just fine! I develop the game on a Mac and I used his memory section to bug test scenes and stuff, so I can't think of why it wouldn't be working. What exactly is wrong with it? The image stays grey and I can't click on it. I can click on the MC and Hayato's memory though, they work fine. That's odd... Are you playing the full Spirit Parade or the Mikio standalone game? Also, just to make sure, Mikio is the next to last "button" on the Memories page, just above Diaochan. 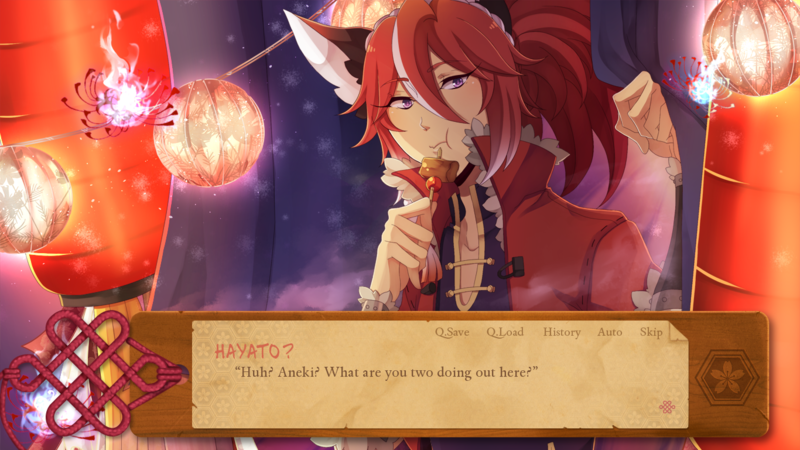 Did you start a new game when you started playing Mikio's route or did you load from a save from when only Hayato's route was available? If you could, try starting a new game and getting to the end of Mikio's route day 10. Hopefully that triggers it... Unfortunately, that's really the only thing I can think of. I've examined the coding and there's nothing that should be preventing the button from being clickable. All it requires is that you've gotten to day 10 on his route (which is the very first scene). Congrats on the second route release! Weird paypal glitches set aside, I've downloaded it and played as soon as I could, even though I was a bit apprehensive because of how much I loved Hayato's route (I often fee guilty of doing another route if the first one had so much impact on me and the characters). But man I loved it a lot! Even more than Hayato's I think - the route and character developement was great, and the fact that Mikio is right up my alley as far as character go in visual novels did help of course. Well, I still hate the Good Ending 2 because I despise that kind of endings haha, but the Good Ending 1 was pure perfection. It was also nice to see a route with far more choices. While it was as easy as Hayato's, it was less straightforward. I still don't have the courage to try and do a bad ending, but that's okay, I don't need it haha. Aaanyway, thanks for the great route, and I can't wait for the dragons now! Congratulations on Mikio's release, I can't wait to play this when I get home! I've played Hayato's route (and have the whole game purchased, ready for updates) and man it was worth the wait! I didn't even think I'd really like Hayato, and I wasn't sure about purchasing the whole thing or waiting for the gods' routes, but I'm really glad I did purchase it after all. I liked it a lot more than I thought I would! I'm not really in the mood to do an actual review, but well, basically, the art and music are great, and I loved the story and characters, so it's all good! People already commented on that before, but the character growth is beautifully done, in both Hayato and Nara. I'm amazed! 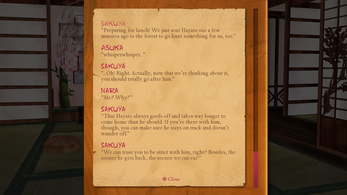 I got four endings - two premature ones, when the group first goes to the festival at the beginning and Nara get's killed, and the one a bit later where she decides she won't go with the kitsunes or Shuye, but rather manage by herself while she's in the Spirit World. Pretty standard premature endings, so nothing here to say. After that, I got both good endings. And well, basically I HATED the second one, and I LOVED the first one (did them in this order since I figured out the main choice for that and wanted to do the one I thought I won't like first). But this is not a problem in the ending itself - it's just that the "going back home" is the thing I hate the most in fantasy stories about a character going to another world (or time period). Well, maybe second to the "it was all a dream", but oh well. And it's even worse if the world where the character went was a fantasy world (while their homeworld isn't). And EVEN worse when a magical creature from that world gets dragged with them to their non magical world. It makes me so upsed I can't even... So yeah, it's one of my pet peeves, but nothing wrong with it per se. On the other hand, the other good ending was so utterly perfect I don't even have words to describe it. Though I must admit I wouldn't be against a kiss scene at the end, but oh well, it was pretty great enough even without that. On a side note about the ending, can someone tell me if the normal and bad endings have CGs? I don't always do the bad endings (and hardly ever do the normal ones) in games, and it's even more unusual if they don't have CGs. But since the art is so gorgeous here, I may be tempted to try getting the other endings. I don't really know how to reach them since the choices for the good ones were pretty obvious, but I guess it's about the virtue thing / how do you get along with Hayato, so yeah, I should manage somehow. Anyway, I had a really great time with this game, and I can't wait for the other routes! Hey I purchased this game back in 2016 and read i should get all future updates....but its still asking me to pay for Hayato's route, so do i need to pay for his route again or is there some kind of glitch? I'm not the devs, but uh. If you bought it back then, you should have it accredited on your account. If you didn't have an account when you bought it, it still should have been on your account, if you used the same email for signing up and buying the game. You should also be able to go here, which gives a much better explanation than I have, to recover your purchase or to find out what the problem is. Hope this helps! Do you guys have a walkthrough for the good endings?